Travel back in time to Ancient Egypt and spin Cleopatra slots! Find out why this slot has been a favourite of players everywhere when you play today! Cleopatra Slots takes you back to ancient Egypt to win your golden riches! This 5 reel, 20 payline slot game is one of the more popular slots online and in land based casinos! The graphics all fit in with the Egyptian theme and include a crook and flail, horus, the gold pendant, scarab, sphinx and lotus carving! The Sphinx symbol is the Scatter and if you can get three or more across the reels you’ll trigger a free spins round where all wins are tripled! Get up to 180 Free Spins when you retrigger this lucrative bonus round! 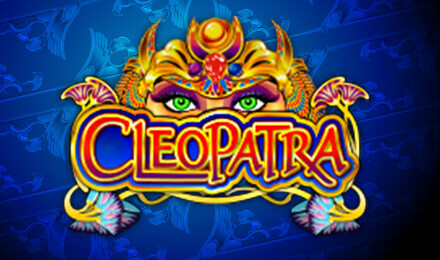 The Cleopatra slots logo is the Wild Multiplier and will reward you with double any wager placed upon that line!